If you checked out my Apple Pie Chia Pudding Recipe, you would have been introduced to the marvelous chia seed. Chia seeds are a pretty neat food because when you put them with liquid they form a gel like substance. This gel like substance does absolute wonders for your digestive system, so these are a definite staple in my pantry. Chia seeds, which you will also see called Salvia Hispanica, just happen to be another superfood that originates from Mexico and was used by the Mayans and Aztecs. There seems to be a trend with all these healthy foods coming from down south! Interestingly, chia seeds come from the mint plant family. 1) Inflammation: By now you know that Omega 3s have amazing anti-inflammatory effects. 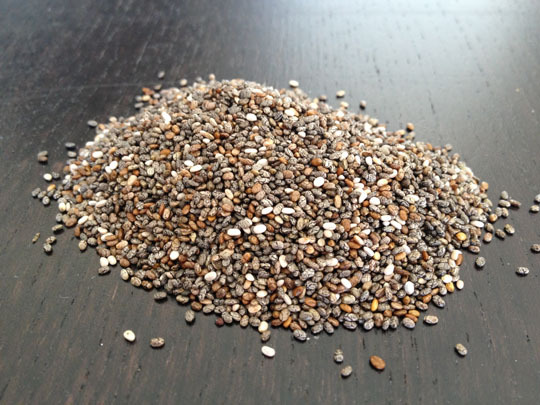 Ounce for ounce, chia seeds contain more than 8x the Omega 3 content than salmon. That being said, you wouldn’t eat the same portion of chia seeds that you would salmon. It just goes to show that a small amount of chia seeds can provide you with a LOT of Omega 3s. (Also, as I mentioned in my salmon recipe, fish Omega 3s are different forms than chia Omega 3s, so chia shouldn’t replace your fish). 2) Fiber: 2 TBSP of chia seeds has a whopping 6g of fiber. That gets you 1/5 of the way there for your daily intake of fiber. I found incorporating chia seeds into my diet did wonders for my digestion, and I attribute it to the fiber content. 3) Athletic Performance: Chia seeds are hydrophilic, meaning they absorb water, so can also help keep you hydrated as an athlete. 4) Calcium and Phosphorous: Again, 2 TBSP of chia seeds contains >10% of your daily calcium and 15% of your daily phosphorous and this is in a non-dairy form! 5) Blood Sugar Control: The fat and protein content in chia seeds helps balance out blood sugar when you consume sugars and carbohydrates. Chia seeds are available almost everywhere now. They’re cheapest to buy in bulk at the health food store, but you can also find them in the regular grocery store in either the baking section or the health food section.